Texture Faux Leather file organizer tote. A perfect tote that fits letter & A4 size papers. This is not a regular paper expanding file that sells at office stores. The unique of this file tote is it was designed for carrying out as your regular bag. It came with the fabric accordion expanding that is durable and flexible than the paper expanding. Perfect for personal and business documents, party and event planning, school and home projects, recipes and photos. Giftable item with gift tag (see image page). Convenient for HOME or on the GO! 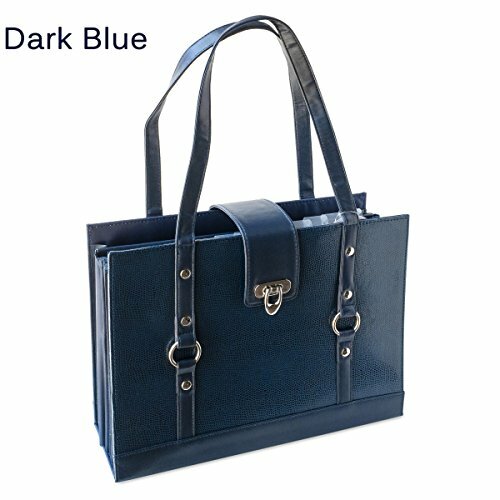 Dark Blue Texture Faux Leather file organizer tote. A perfect tote that fits letter & A4 size papers. 12 fabric expanding file pockets and one expandable faux leather storage ideal for your ipad, small laptop and stationery. Texture Faux Leather is used to complete this fancy and functional piece of file tote. Shoulder length handles perfect to carry around your documents to and from work. Easy care. The surface can be Cleaned with damp cloth. USA designed and Imported.